Hi There, today is Monday and my turn to participate in the Around the World bloghop, to share my take on The Creative Process. Many thanks to Raewyn who blogs at Love to Stitch for inviting me to share in this interesting topic. One of Raewyn's latest Mystery quilt adventures - in miniature this time! I often feel disappointed that fellow bloggers don't share anything about their craft, other than The Eye Candy: what the latest project is and what the latest fabric purchases are. Not that there is anything wrong with that now and then (sometimes that's about it in my world too) - we all love new projects and certainly love new fabric - but there is a whole other side to this quilting thing, that I feel, is often neglected - How did this wonderful project come about? Why did you choose that background, or feature fabric? Why did you choose this technique over that one? The design process, the quilting decisions... the list goes on... I want to know it all! So this is a bit about me, how and why I create the things I do. I'm not sure if I can formulate my thoughts into answers to these exact questions... but we'll see how it goes. The first one is easy... what am I working on? Everything! I have many projects in different stages of construction and turn to different projects depending on my mental and emotional state, what the weather's been like, and the ups and downs of parenthood. I enjoy the monotony of chainpiecing, and when the world all becomes a bit much - I love to pull out an old, or start a new, pieced quilt. Other times I feel a strong pull towards the creativity of applique, and have far more applique quilts started than I can probably ever finish. My projects are somewhat similar in that they tend to use a wide variety of fabrics. I love these soft greyed fabrics, and duckegg blue is among my favourite colours - but I also enjoy contemporary and modern prints, as well as bright and fun designs - so I try not to be limited by a particular genre. I tend to buy small quantities of fabrics - often fat quarter or fat eighth size, and have collected an impressive collection, which I am always on the look out to add to. When there is a designer range of fabrics that I just have to acquire, I'll often purchase a charm pack - this satisfies my need for all those different fabrics... but also gives the credit card time to cool down. I make big quilts. I don't know exactly why this is... but even my little quilts are bigger than the average bear. The challenge of making small amounts of fabric add up to a large quilt top is part of the magic of what makes my quilts uniquely mine. My quilts have been described as scrappy, and yes, they do have a lot of different fabrics - but there has also been an enormous amount of care, attention and time that has gone into curating the final palette. Because I am limited by the quantity of individual fabrics on hand, I need to be creative in choosing quilt designs that embrace variety... as well as lots of small bits. I love the challenge of finding a quilt pattern that highlights the fabric in the best way possible - and, like many others, I rarely make the same design twice. 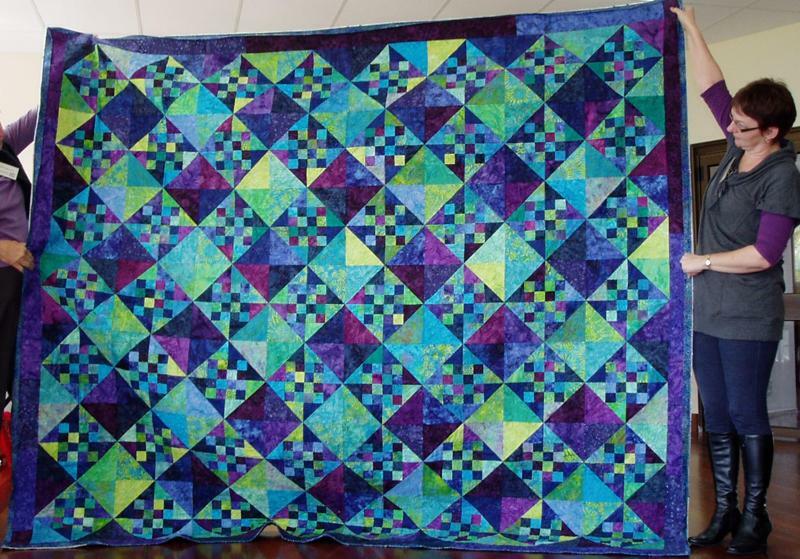 This is basically a two colour quilt - but includes purple through to navy and black in the dark zones, turquoise, green and everything in between in the light. I collected these batik fabrics over a three year period with no idea what I was going to do with them. ...and I start looking for a quilt design that will enhance the fabrics that I have chosen. Playground Quilt by Camille Roskelley, featuring Reunion by Sweetwater. This one was so perfect that I used the pattern as well as the same fabric line! ... and I'm completely happy to embrace all quilt creation methods. I think that's enough about me... please leave a comment if you have a burning question! Now to pass you on to the lucky bloggers continuing the bloghop, continuing with the International theme are two other Northland quilters who have moved to NZ from other countries. Mathea is a newer friend, who although she creates using a variety of patchwork techniques - her focus is often a small, amazingly creative art piece - you'll find her blog here. Both ladies will be posting on the 1st September - so check out their posts on how they create their own masterpieces. Certainly some deep thought has gone into this post. Nice to see some of your quilts again. I agree with Leeanne- you have put a lot of thought into this post! (No wonder i didn't want to do it- I sew because I love it!) You have such variety in your quilts Suz and boy, are they big! And you have given me something to think about the next post I write....techniques, designs, fabric first or design! You certainly have me thinking! I'm with you - I love hearing more about process and decisions and all that goes into a quilt. Love the eye candy too of course.....and there is plenty of that in this post. OH...hadn't seen the batik beauty! I learn from hearing about the dirty details too! And you know I totally understand the biggie quilt thing...I fight it all the time. Interesting post Suz! And I agree, it is intersting when people talk about their processes etc. You have made such a lovey array of (big) quilts :-) Thanks for playing along. I love the fabrics you use. Interesting that they definitely fall into two camps, the muted greyed fabrics and the bright modern designs. If I was asked to describe your quilts I would immediately think of those two colour ways. You do lovely things with them too.